Our birders have been witnessing the magnificence of the spectacular fall bird migration here at the Dry Tortugas National Park this week. The seven tiny islands of the Dry Tortugas have always been a vital layover for the migrating birds traveling between the United States and South America. Each season offers the opportunity to see something very unique at this most exquisite birding location. This week our birdwatchers were lucky enough to spot the Common Grackle walking around the Tortugas. It's rumored that larger-brained birds walk instead of hop. In any event, this particular Common Grackle was interesting to watch while foraging for its food along the tide line and actually wading in the water to catch live fish. These Grackles also feed on insects, minnows, berries, frogs, seed, and grain. They are a very adaptable species able to adjust to the changes humans have made to the landscape, easily learning to find food in pastures, farmlands, or anywhere else that can accommodate its omnivorous appetite. Unfortunately, farmers consider them more of a pest. The Common Grackle has been the overlooked blackbird, the one that is there but rarely noticed, seldom contemplated, and never appreciated. But, for the moment, let's not overlook this very unappreciated blackbird. It's no wonder the Common Grackle has often been known as the Crow Blackbird with its large "crow-like" beak, dark color, and inclination to behave like a crow. But these guys are stunningly beautiful with their black plumage, bluish iridescent-colored feathers, and bright yellow eyes. The male is about 13 inches in length and the females are around 11 inches. The Common Grackle has also been regarded as perhaps the most self-confident bird. They tend to move about with shoulders back, head erect, and chest out with a most intimidating stare with their piercing bright yellow eyes. 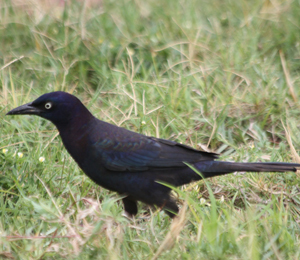 When the Grackle lands around other birds eating, it is with this cocky attitude and intimidating gaze that frightens other birds and causes them to flee. They can also be seen in bare tree branches displaying. To appear twice as big, the male will puff his feathers out, spread his tail, and open his wings. It is not known if he is boasting about his prowess, or simply scaring off his competitors. With their exceptional intelligence, this bird often steals dry dog food from bowls and flies to a pond or puddle nearby to dip the pellet in the water until it is soft enough to eat. Another interesting fact about this species is that they permit ants to crawl on them and secrete formic acid, probably to rid themselves of parasites. Well, we certainly had an interesting week with our visiting Common Grackle. Rest assured there will be many more interesting weeks here at the Dry Tortugas. Come out and join in the fun!